Does anyone recognise this piece of archaic-looking hardware? I suspect it's a trainer or maybe it's a board which can be used for programming EPROMS? It has a CPU I don't recognise. A 1082. I haven't Goggled it yet. The handmade case makes the device look older than it is. 1984 is stamped on the board. 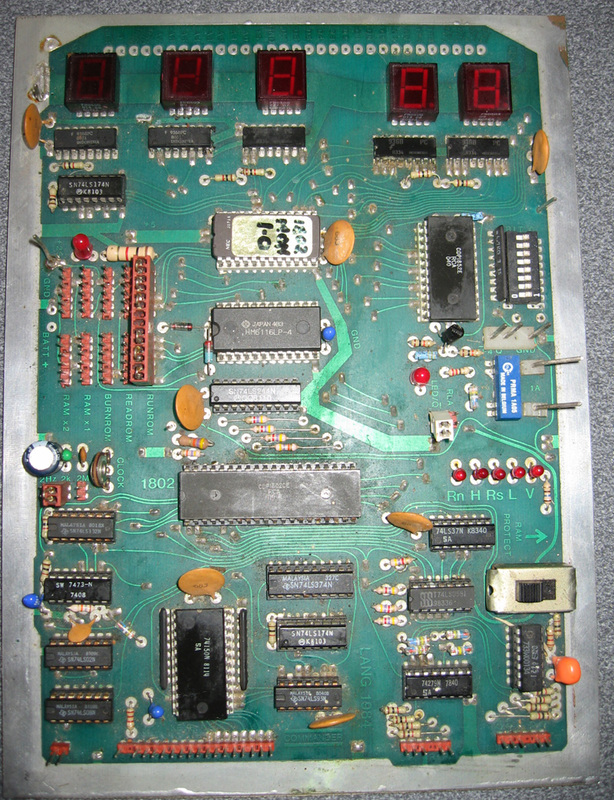 I haven't been able to identify the board but the CPU is an RCA 1802, as used in the COSMAC ELF and Super ELF, etc. If you have a mind to sell it, I would definitely be interested, just for the chip alone. The CPU is an RCA 1802. Those things were used in space even... nice! The chip up by the DIP switches is an RCA 1852 8-bit I/O controller. So I'm suspecting, this board was either a microcontroller for something (hey, that's fine... that's what the MOS 6502 was designed for too) or was a trainer platform for the RCA 1802 CPUs. I'll do a bit more digging, see what I can find. Thanks for those comments. I've now done some research. Yes, a RCA CDP1802 device possibly based on the ELF-range of computers. As one person mentioned in another forum I posted this message to, 1984 is a bit late for a 1802 trainer. It's also a bit late for a "build-you-own-computer" kit when you could easily buy a C64 off the shelf. I'm puzzled as to what if would have been made and sold for. What was the purpose. Perhaps it was used to control something else, although the homemade case would suggest something of a hobbiest nature. The only thing that hints at a manufacture is “Lang 1984” and the small word “Commander” at the very bottom in the centre. I don’t know if it was made here in NZ or elsewhere? Tantalising lables like "BURNROM", READROM and RUNROM would suggest it could (or had) some role in play in burning EPROMS? #welshwizard - If there was relevant info in that link you posted, I couldn't seem to find it? followed the link myself, not sure what I did but nothing like the site that was to have come up, will see if I can remember where the right link in my files and repost it, hopefully the right one this time. It should be a link to a Lang Precision positioning system from about 1986, only seem to be able to find the 1994 model now. Thanks for that. It does reveal something. Although the document is not on the LANG Commander itself, it does mention it as a way to control the MCL precision positioning system. This reveals a few possibilities...taken with a grain of salt given that the document is far more recent than my device. Trawling the web, this document seems to be the only thing on there that mentions the LANG Commander. It does have an email address though. I'll enquire. 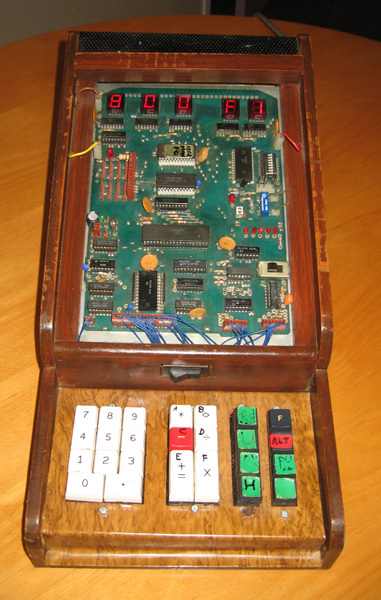 Most likely situation by looking at it, is that it's a microcontroller that's been put in a homebrew chassis in order to use it as a microcomputer, or to simplify programming it. Thanks for your help guys. I also posted a note on the International Vintage Computer Forums and got some feedback from there. I've summarised what's been found/discussed in this blog entry. I'll update it if I find out more. Have you done a ROM dump? Not yet but it is on the "to do" list. Monitor ROM dumped. Looks like it contains code. Only 733 bytes though but that is probably par for the course for this kind of thing. I now know where this RCA CDP1802 (COSMAC) trainer of unknown origin comes from. It's completely homegrown. From Wanganui no less. The (Dave) Lang Commander. Ah that's an epic little piece of local history. Nice work. I've found that knowing where a device/computer came from and having a little history just makes owning it so much more rewarding/satisfying.